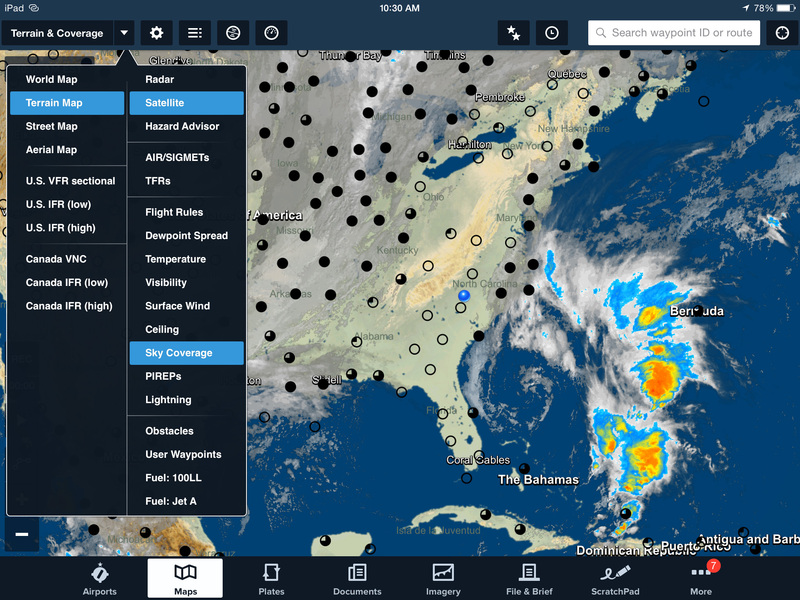 The ground-based radar mosaic displayed on the Map view in ForeFlight Mobile combines radar data from the National Weather Service (NWS) and Environment Canada. Its primary purpose is to provide pilots with a good estimation of where precipitation is occurring and where it’s not. While there are some holes in the coverage (especially in Canada) the radar mosaic is fairly accurate most of the time. Even so, non-precipitation returns generically called ground clutter can be displayed on the radar layer producing what looks like very real areas of precipitation. Anomalous propagation, or AP, is perhaps the most annoying form of clutter. Essentially with AP, part of the side lobes of the radar beam are ducted or bent down toward the earth during certain atmospheric conditions. This causes it to strike objects on the ground (trees, buildings, cars, etc.) and some of that power from the beam is reflected back to the radar along the same bent path and gets recorded as areas of precipitation. 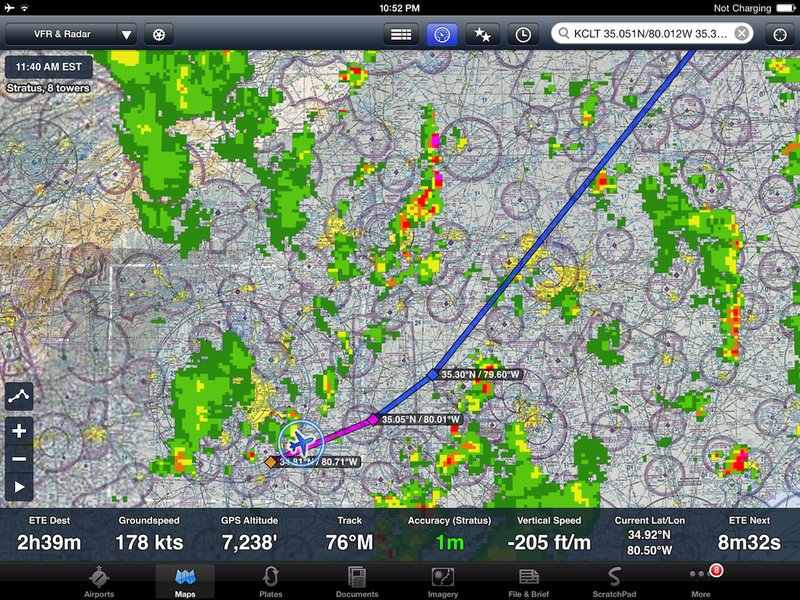 When this occurs you might see on ForeFlight what looks like real precipitation. In fact, it can look remarkably like real convection at times fooling even the most seasoned pilot. 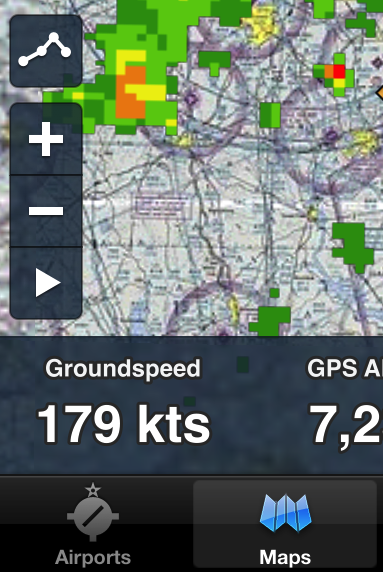 Anomalous propagation (AP) on the ForeFlight radar layer near Buffalo, New York. 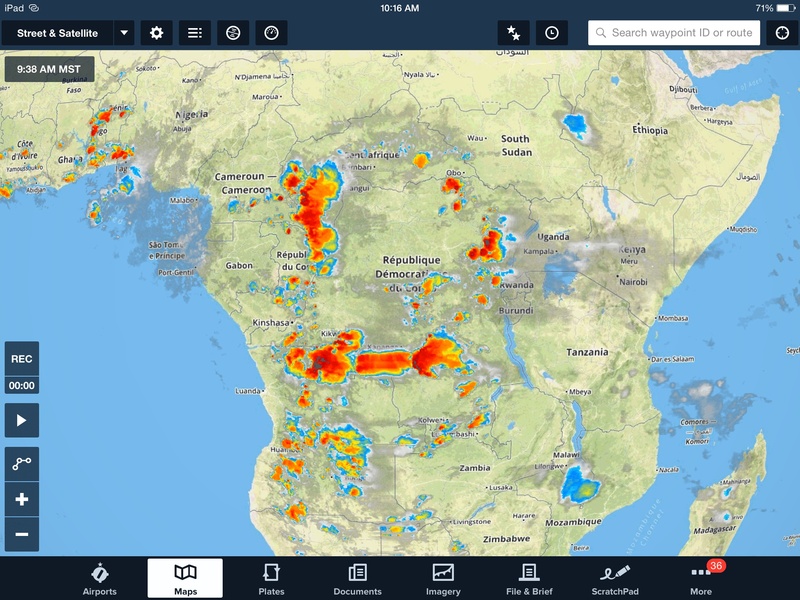 Since AP can look remarkably like real areas of precipitation (including thunderstorms), it’s important to always examine the observational data in and around the area. This includes cross-checking surface observations (METARs) to see if precipitation or thunderstorms are being reported. Also, without clouds, it can’t rain. So if clear skies are being reported all around the area, then either the precipitation shown on the radar is very isolated or perhaps it’s erroneous. Keep in mind that automated reports only show clouds that exist below 12,000 feet AGL. 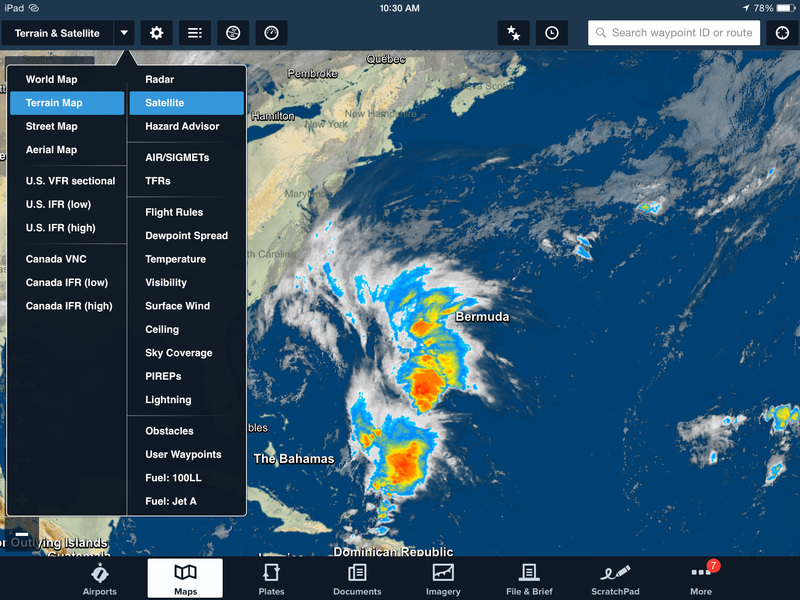 Along these lines, the visible satellite imagery in ForeFlight Mobile can also be useful to identify non-precipitation returns during the daytime hours. If precipitation exists on radar, there should be clouds in that region even if it is isolated convection. If there are no clouds, the returns on the radar are likely ground clutter or AP. Even when the area is cloudy, AP can still exist. If this is the case and you suspect AP, try looping the radar. Most real precipitation moves and evolves over time, but AP tends to stay anchored over the same area with little noticeable movement. Moreover, the radar loop may look erratic and the intensity may change in a way that’s unnatural. While AP can occur the U.S. it tends to occur the most in the Canadian Provinces. A favored place is on the U.S. side of Lake Erie just onshore and also in the mountains of the Pacific Northwest in British Columbia. While AP can occur anytime of the day or night, it’s often favored during the morning hours just before and after sunrise. This the time of day where the atmosphere is generally stable near the surface which is a perfect environment to allow the side lobes of the radar to be ducted. So why can’t AP be filtered? Filtering the radar of non-precipitation returns is like walking a fine line. If you filter too aggressively, you may remove real areas of precipitation; if you don’t filter enough, you get clutter such as AP displayed. In the U.S., filtering can be automated since the Doppler portion of the radar is available. This can be used to help filter AP and other ground clutter. While Canadian radars are Doppler radars, Environment Canada does not export the Doppler data at this time. Also in the U.S., the NEXRAD ground-based radar systems are all fitted with a dual polarization (dual pol) capability which can provide additional information to filter non-precipitation returns. At the moment the only way to guarantee that AP from Canadian radars won’t find its way into the ForeFlight radar layer is to add a gross filter before the data reaches the display. This is accomplished by our radar provider by manually turning off the data coming from the offending radar(s). This can be risky since it means that all returns shown from this radar will be eliminated, false or not. The folks at Barons who produce the XM-delivered satellite weather also face the same issue with Canadian radars. They don’t turn off specific radars. Instead they create a manual gross filter that eliminates all returns over regions that are highly unlikely to receive precipitation. In the end, every piece of information you use to make preflight decisions should be scrutinized even if it comes from a trusted source. Take the time to cross-check the radar layer against other sources within the ForeFlight Mobile app so you won’t be fooled. To celebrate fall, we’ve added a touch of color to our global satellite layer! The color-enhanced infrared (IR) satellite image is designed to visually highlight the coldest cloud tops. Cold cloud tops are often indicative of active thunderstorms that can produce severe or extreme convective turbulence. The animated satellite layer updates every thirty minutes and is accessed in the map mode menu in the Maps view. Any object that has a temperature warmer than absolute zero will emit radiation at many different wavelengths. Radiation produced by the earth and its atmosphere is emitted spaceward from land masses, oceans, lakes and the top of most clouds. Satellite sensors are used to measure this radiation that includes both visible light and those wavelengths that are invisible to the naked eye. The radiation emitted in the infrared part of the electromagnetic spectrum is the source of data used to build our IR satellite layer. To create this layer, five geostationary satellites look at the entire earth (with the exception of polar regions) and measure the amount of infrared energy being emitted. The infrared satellite sensor measures the amount of energy and calibrates it to temperature using a very simple physical relationship known as Planck’s Law. High clouds are very cold and emit less infrared radiation than warmer clouds near Earth’s surface. Furthermore, land masses are usually warmer than most clouds. Since the satellite can’t directly distinguish between the earth’s surface and clouds, we employ a software algorithm that determines where it is cloudy and where the sky is clear. While this works well most of the time, snow cover, fog and even the oceans can sometimes fool the algorithm. We recommend using the Sky Coverage and the Satellite layers together to get the most accurate picture. Data measured by the satellites is calibrated and colorized according to the temperature. Warmer objects emit more infrared energy and colder objects less. Shades of gray are used to represent the lowest-topped clouds; the darker the shade of gray, the lower the cloud tops. For higher-topped clouds, color is added. Just above the lightest shades of gray you may see blue and green colors introduced representing still colder and higher tops. Above this, shades of red, orange and yellow represent the coldest and highest cloud tops. As the temperature of the atmosphere generally decreases with height, a pilot can get a pretty good idea which clouds are high-level and which are low-level based on the color or shades of gray depicted. The IR Satellite layer allows you to quickly locate the most dangerous weather anywhere in the world. Ground-based radar provides a multitude of information on the location and movement of convective weather, however it is limited to US and Canada. The IR Satellite layer gives you a global, at a glance view of significant weather. This is especially important if you are planning a flight over large bodies of water. In this image over central Africa, you can quickly see where the most significant weather is located, especially in regions that have a cellular appearance depicted in deep red, orange and yellow colors. One thing to note is that thick cirrus clouds at very high altitudes will also show up as very cold clouds even though they may not be associated with deep, moist convection. Most of the time these high cirrus clouds do not have the same cellular appearance as convective clouds and thus have very little variation in color.